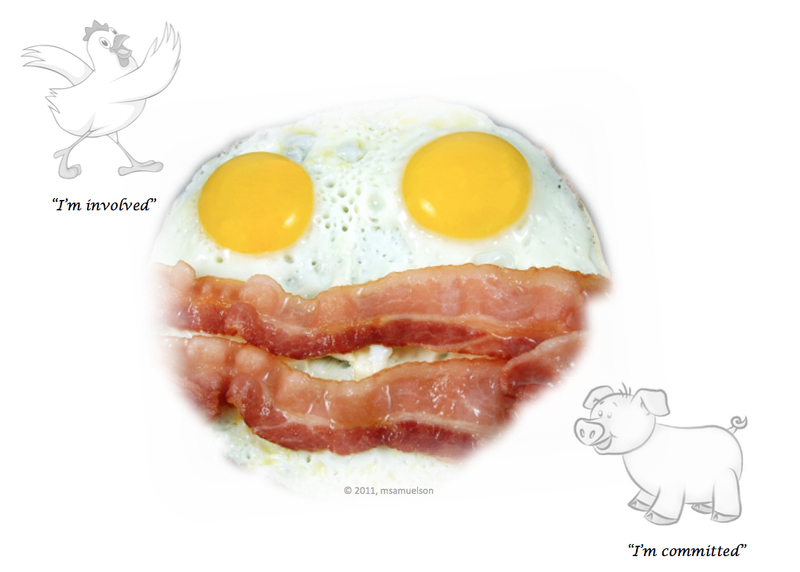 We all know the chicken and pig breakfast reference. One is involved and interested, the other, however, is truly dedicated and committed. 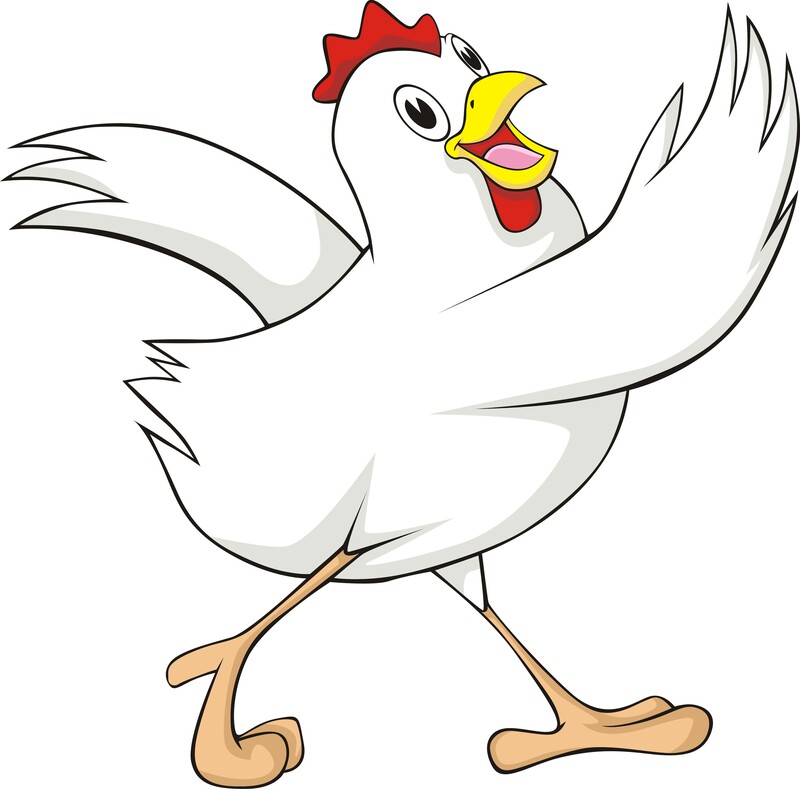 So, when it comes to wellness, are you a chicken or a pig? And, yes, I know what you’re thinking and I agree…it’s just that the graphic was too much fun to make and too compelling for me not to use. Don’t get me wrong, involved is great. We need more people to get involved in wellness activities. However, if you want to be a leader in this field you’re going to need to be committed to do whatever it takes to turn the sickness/wellness game on its head. And, that means making noise, taking risks, living the life, being an active role model, and—in rapid turn-style fashion—assume the roles of diplomat, irritant, fact-finder, myth-buster, vocal supporter and vocal dissenter INDEPENDENT of your own political and occupational safety. It’s one thing to cheer and back-slap at a health promotion conference with cronies and quite another to question a chili-cheese-dog-loving-bring-on-the-donuts CEO on the merits of cafeteria reform. The “Involved” and quiet supporters will always make healthy food selections or bring their own healthy lunch to work. The “Committed,” however, will stump for awareness, education and activities to advance a healthy culture for all employees. Again, please don’t think that I don’t appreciate the role of a good follower who rallies behind an important issue. I do. These people are the backbone of any great movement. That said, every significant initiative, if it is to grow and overturn status quo, must have strong, bold and, at times, daring, leadership. I believe it all comes down to passion and purpose. Regardless of where your constructive passion bubbles from, it is important for your overall wellbeing that you launch a campaign of self-discovery. You need to find the source of not what makes you tick but what makes you WANT to tick. There’s a difference. 2. Assume you die, today. Sorry about that. Now, write your own obituary. Yes, I know it’s somewhat macabre, but it works so open your eyes — heart, soul and mind — and just do it. Okay, I can hear some of you saying that it’s too much work and that you’ll do it later. No you won’t; the “Yeah, But…” syndrome will get it in the way. Or, closer to the point for some, you won’t do it because you don’t want to face your current reality (sleepwalking and whining are much easier). Some of you might simply avoid this exercise with the catchall “this is stupid” excuse. But, some of you hearty souls will dig right in and be amazed, pleased, depressed, encouraged, enlightened, lie to yourself, proud, pleased, motivated to change or quickly crawl under the covers with a pint of Ben & Jerry’s Chunky Monkey while cursing the fact that you dared to OPENED YOUR EYES. As with everything else in life, you have a choice. You can remain in a deep stupor or you can AWAKEN to the good, the bad, and the ugly reality of where you are today…with the understanding that the little orphan Annie kid is right. 3. It’s a miracle! You get to live another twenty years! Now, write your revised obituary and watch your passion begin to appear. 6. Ask 3 friends (family counts) for their impression of where your passion lies. 7. List 3 – 5 books you’ve purchased the past 2 years. 10. Reflect on the above and journal your thoughts (no more than 3 pages), first thing in the morning, each day for a week. Let it flow…don’t edit. See (hear, feel, sense) where it takes you. After a career in the health promotion cheer leading squad, I gave up my pom-poms. Perhaps it was the study that advocated putting 11 year olds on statins. Maybe it was seeing red hearts on so many processed foods that the heart’s meaning is now watered down, questioned, and finally, overlooked. Its brand obliterated by the dollar; yes, we all have our price. It is difficult for those whose career depends on doing that kick line in fine form to stop. To analyze. To use that fine education that has taught them – better. Because rocking the boat today is a scary thing to do. Just like the bus driver who is forced to drive hours and hours into overtime, exhausted and impaired, but knowing that if he says anything – brings the issue to the table – he will, most certainly lose his job – and there are so many standing in line to take that job of the rabble-rouser. What that reality does is make the impetus for “the elders” ever more important. It is up to those who no longer depend on or are fearful of economic retaliation in terms of job loss or being ostracized from their position “at the table”. These voices are powerful. Listen. They are out there. They are our self-published authors; makers of websites of truth; some even run for office (not many). They speak to groups who want to hear them. They have purity of message. They do not wear jackets with emblems endorsing brands and products. They do not give away pens that tout Pepsi or Coke. They are out there. They are writing blogs. And doing radio interviews. They are tenured professors. Listen to these voices when the roar of the crowd is still…and the pom-pommers have gone away.